The following year Amr entered in triumph through the Gate of the Sun that closed the eastern end of the Canopic Way. Little had been ruined so far. Colonnades of marble stretched before him, the Tomb of Alexander rose to his left, the Pharos to his right. His sensitive and generous soul may have been moved, but the message he sent to the Caliph in Arabia is sufficiently prosaic. He writes: ‘I have taken a city of which I can only say that it contains 4,000 palaces, 4,000 baths, 400 theatres, 1,200 greengrocers and 40,000 Jews.’ And the Caliph received the news with equal calm, merely rewarding the messenger with a meal of bread and oil and a few dates. There was nothing studied in this indifference. The Arabs could not realise the value of their prize. They knew that Allah had given them a large and strong city. They could not know that there was no other like it in the world, that the science of Greece had planned it, that it had been the intellectual birthplace of Christianity. Legends of a dim Alexander, a dimmer Cleopatra, might move in their minds, but they had not the historical sense, they could never realise what had happened on this spot nor how inevitably the city of the double harbour should have arisen between the lake and the sea. And so though they had no intention of destroying her, they destroyed her as a child might a watch. She never functioned again for over 1,000 years. 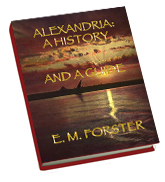 We have now seen Alexandria handle one after another the systems that entered her walls. The ancient religion of the Hebrews, the philosophy of Plato, the new faith out of Galilee—taking each in turn she has left her impress upon it, and extracted some answer to her question, ‘How can the human be linked to the divine?’ It may be argued that this question must be asked by all who have the religious sense, and that there is nothing specifically Alexandrian about it. But no; the question need not be asked; indeed, it was never asked by Islam, by the faith that swept the city physically and spiritually into the sea. ‘There is no God but God, and Mohammed is the Prophet of God,’ says Islam, proclaiming the needlessness of a mediator; the man Mohammed has been chosen to tell us what God is like and what he wishes, and therein ends all machinery, leaving us to face our Creator. We face him as a God of power, who may temper his justice with mercy, but who does not stoop to the weakness of Love, and we are well content that, being powerful, he shall be far away. That old dilemma, that God ought at the same time to be far away and yet close at hand, cannot occur to an orthodox Mohammedan. It occurs to those who require God to be loving as well as powerful, to Christianity and its kindred growths, and it is the weakness and the strength of Alexandria to have solved it by the conception of a link. Her weakness: because she had always to be shifting the link up and down—if she got the link too near to God, it became too far from man, and vice versa. Her strength: because she did cling to the idea of Love, and much philosophic absurdity—much theological aridity—must be pardoned to those who maintain that the best thing on earth is likely to be the best in heaven. On July 1st 1798 the inhabitants of the obscure town saw that the deserted sea was covered with an immense fleet. Three hundred sailing ships came out from the west to anchor off Marabout Island, men disembarked all night and by the middle of next day 5,000 French soldiers under Napoleon had occupied the place. They were part of a larger force, and had come under the pretence of helping Turkey, against whom Egypt was then having one of her feeble and periodic revolts. The future Emperor was still a mere general of the French Republic, but already an influence on politics, and this expedition was his own plan. He was in love with the East just then: The romance of the Nile valley had touched his imagination, and he knew the way led to an even greater romance—India. At war with England, he saw himself gaining at England’s expense an Oriental realm and reviving the power of Alexander the Great. In him, as in Mark Antony, Alexandria nourished imperial dreams. The expedition failed but its memory remained with him: he had touched the East, nursery of kings. The lighthouse took its name from Pharos Island (hence the French ‘phare’ and the Italian ‘faro’). No doubt it entered into Alexander the Great’s scheme for his maritime capital, but the work was not done till the reign of Ptolemy Philadelphus. Probable date of dedication: B.C. 279, when the king held a festival to commemorate his parents. Architect: Sostratus, an Asiatic Greek. The sensation it caused was tremendous. It appealed both to the sense of beauty and to the taste for science—an appeal typical of the age. Poets and engineers combined to praise it. Just as the Parthenon had been identified with Athens and St. Peter’s was to be identified with Rome, so, to the imagination of contemporaries, the Pharos became Alexandria and Alexandria became the Pharos. Never, in the history of architecture, has a secular building been thus worshipped and taken on a spiritual life of its own. It beaconed to the imagination, not only to ships at sea, and long after its light was extinguished memories of it glowed in the minds of men.